Now don’t be thinkin’ this is about politics or something. It’s about the announcement today that the US Air Force has thrown some money – $ 2 million – at Lockheed Martin to begin to develop a reusable flyback space booster. This is not a new idea. Most ideas being studied in the space business have been around for a while. Mostly what they take is money to actually build prototypes and test them and then fix the bugs and build some more, unlike our current way of building space vehicles: build one and BY GOD NOTHING BETTER GO WRONG OR WE’LL NEVER GIVE YOU ANOTHER DAMN DIME YOU LAZY ROCKET SCIENTISTS! (That’s not me, that’s Congress and the Administration; pick a political party in power. Both have looked at it the same way. We can spend millions of extra money trying to get the bugs out of the F-35, which should probably never work right, but not one more penny for extra space vehicles. In fact, NASA is hoarding the last of the Shuttle Main Engines to use for the heavy lifter. But back to LockMart’s new RSB Pathfinder. RBS is for…wait for it…Reusable Booster System. It will be proof-of-concept, not operational. What a concept? Boeing quietly built those X-37Bs for the USAF and nobody really knew much about them, and now one has been in orbit, doing God knows what, for over six months. Flyback boosters have been designed since the 1950s. There is a great deal of information on many of these designs available in Aerospace Projects Review, an e-journal Scott Lowther has helmed for years. I highly recommend it for anybody who is interested in the history of space and aircraft projects that never flew. Nobody does research on this stuff like Scott! His regular site, with a lot of drawings of historical aerospace projects, is here. One of the most important of the flyback booster designs was presented about a decade ago by a company called Starcraft Boosters, headed by moonwalker Buzz Aldrin. It was a great idea. Buzz even presented it in a science fiction novel called The Return, co-authored with John Barnes. 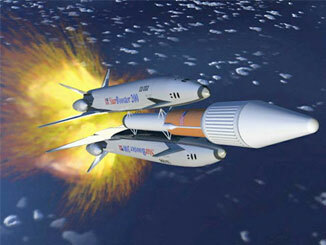 One version was based on an Atlas 5 launcher with wings and jet engines. All of them would be remotely controlled. So maybe this is the time. The Air Force is not as fickle as NASA, and can afford not to be. Two million bucks isn’t much to start with, but it will show the brass some pretty computer graphics and some PowerPoints. Eventually they will have to throw in some more money. 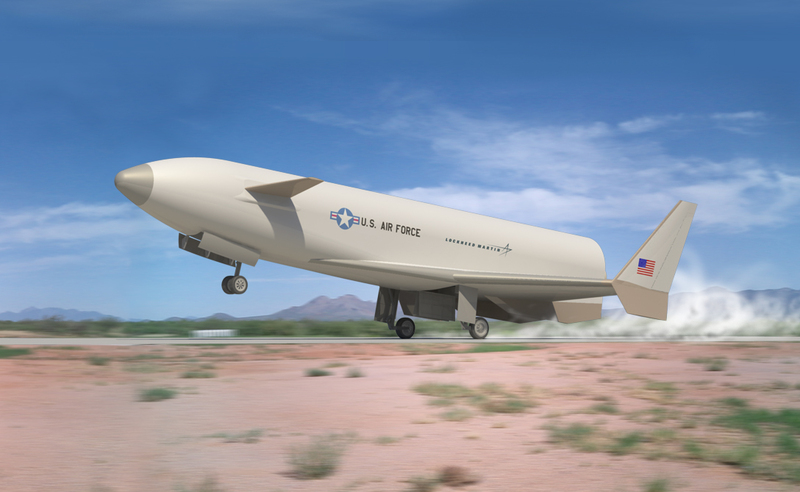 However, like the X-37, which started out as a NASA project that never got past drop tests, the Air Force actually intends to buy stuff that works. You see, they have reasons to buy stuff. NASA still does a good job setting missions for unmanned planetary probes. Well, actually, the Jet Propulsion Laboratory and some universities set some good missions and companies like Orbital Sciences build some good hardware. But the Air Force can think in the long term, and can resist the pull of Congresscritters better than NASA. Maybe what we needed to do, way back in the 1950s, was to turn the whole space program over to the Navy. (There was this retired Annapolis graduate, invalided out because of tuberculosis with a rank of only lieutenant j.g., who probably should have been in charge of it. 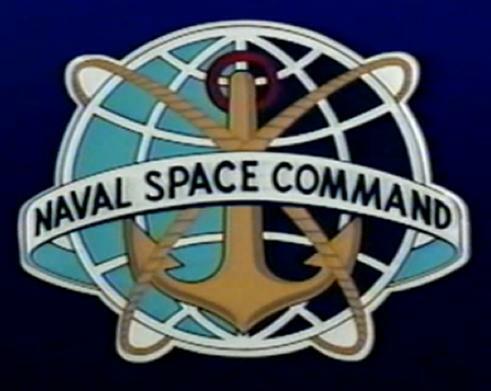 Although Admiral Heinlein of the U.S. Space Navy sounds better, doesn’t it?) I think this is a topic for another day. You are currently browsing the The Old Gray Cat blog archives for the day Thursday, December 8th, 2011.